The WHS is proud to have published two major award-winning books on local history. 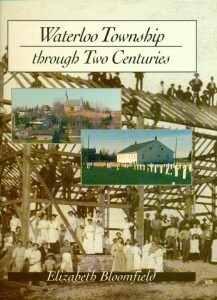 Waterloo Township through Two Centuries authored by Dr. Elizabeth Bloomfield of the University of Guelph won the Fred Landon Award for Regional History in 1996. It was revised and reprinted in 2006 and is available again in quantity. Waterloo Township disappeared during the formation of the Regional Municipality of Waterloo in 1973. It was the oldest of the five townships which made up Waterloo County. This detailed history covers all aspects of settlement, development, social and business life, education, etc. It contains numerous maps and charts and is profusely illustrated by photographs. The book costs $45 (plus postage if applicable). Email us to obtain more information or order the book. 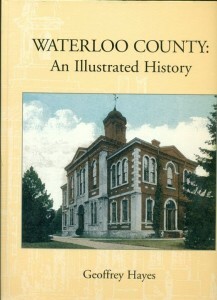 Waterloo County: An Illustrated History was published in November 1997 and written by Dr. Geoffrey Hayes of the University of Waterloo history department. This book also won the Fred Landon Award for Regional History. The County of Waterloo disappeared during the formation of regional government in 1973. Dr Hayes’ comprehensive book begins well before the actual formation of the county in 1852. He covers in detail the earlier years governance systems and shows how Berlin was able to become the county seat. The next 120 years of county life end with the decision by the provincial government to combine, amalgamate and alter the various administrative units within the county. Waterloo County: An Illustrated History costs $55 (plus postage if applicable). Email us to obtain more information or order the book. In 2012, as part of the WHS 100th anniversary celebrations, a special Centennial Supplement was published. It contains several articles from each of the first ten decades of the society’s annual volumes. Copies of the Centennial Supplement are available from WHS at $10. See the Annual Volume listing for information on ordering. The 306-page publication contains, in addition to the original articles, an introduction detailing the idea behind the book; a lengthy Afterword with information on the articles and their authors; plus a brief history of the WHS annual volume and other publications by the society. In the Afterword, mention is made of an important essay on reading Waterloo County / Region history by Dr Geoffrey Hayes.